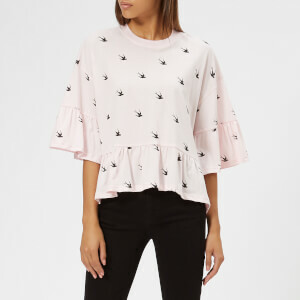 Women’s ‘Loose Ruffle’ cotton T-shirt from McQ by Alexander McQueen. Crafted from soft, lightweight cotton, the tee comprises a classic crew neckline, ¾ length sleeves and wide ruffle detailing at the sleeves and hem. The brand’s signature swallow print in a contrasting colour features across the whole design.